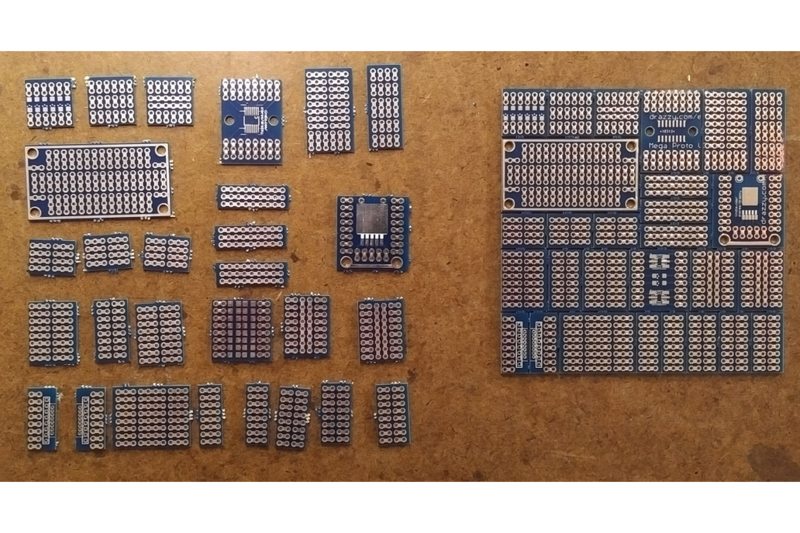 Little pieces of prototyping and breakout board for small projects, $6 for 28-piece set, $4 for 12-piece SMD set! Sometimes you need a big piece of prototyping board, like my other products. Other times, you just need a tiny little piece of it - and now you can do that without having to try to cut up big pieces of protoboard (which will ruin the blade on most things you might use to cut it alarmingly quickly). That's why I made these! Packs containing multiple boards will arrive in a small panel as shown and can be separated easily (no tools are needed). Over 15 square inches of prototyping board, over two dozen pieces (a $10 value), for only $6, and you save a bundle on shipping too. Just about any little piece of prototyping board you could need, and then some! This package is focused on through-hole prototyping board - see below for the more SMD-centric offerings. 2 Pcs 2x8x2/2 - Two rows of 8 groups of 2 pins, with two groups of 8 pins (for power and ground) in the middle - for very small projects. 1 Pcs 2x6x2/2 - Two rows of 6 groups of 2 pins, with two groups of 6 pins in the middle. 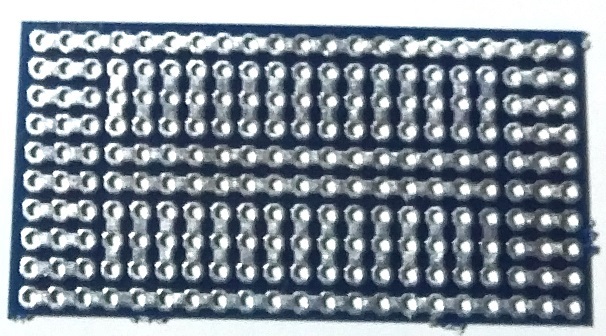 1 Pc RGBLED/SMD squares - two 5050 (RGB LED) or SOT23-6 outlines and 2 1206 outlines on top, 24 square pads on bottom, broken out to groups of 2 pins. 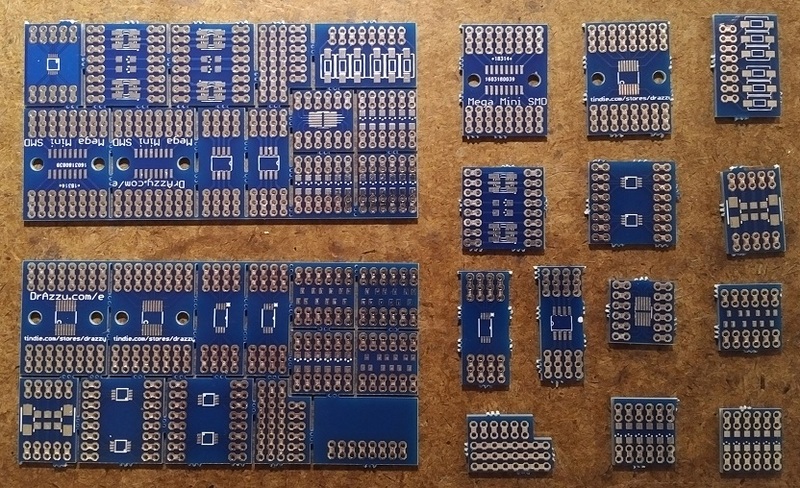 Over 7 square inches of SMD-friendly prototyping board, over a dozen pieces for $4. 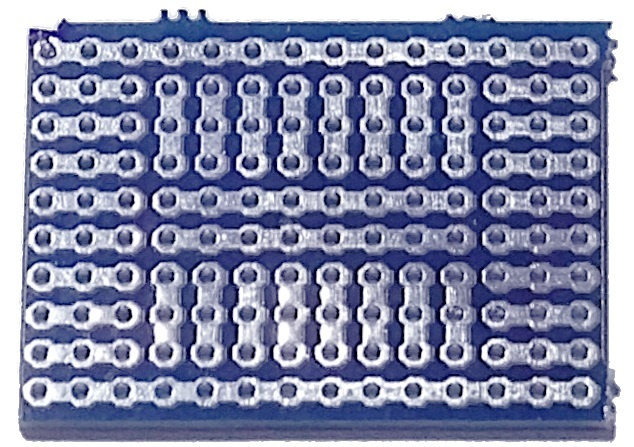 This package contains breakout boards for many of the most common SMD packages. 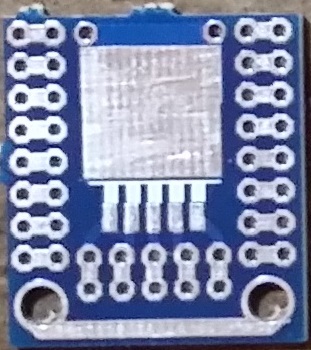 2 Pcs RGBLED/SM8 - 2 SM8 outlines on one side, two 5050 (RGB LED) or SOT23-6 outlines and 2 1206 outlines on other side, broken out to groups of 2 pins. 1 Pc 1206/MSOP-12 - 6x 1206 outlines on one side, MSOP/DFN-12 (0.65mm pitch) outline on the other, broken out to groups of 2 pins. 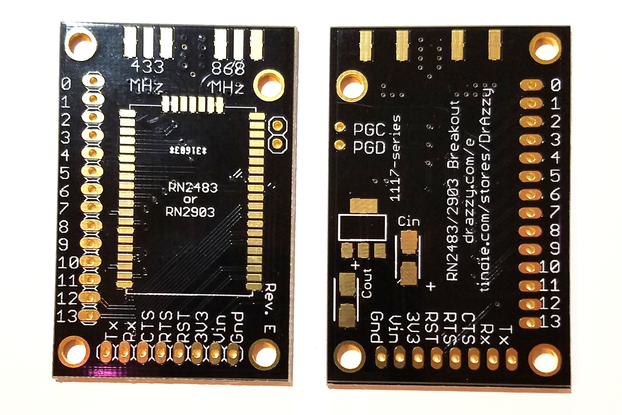 An interesting take on small pieces of through-hole prototyping - perfect for prototyping with an assortment of passives or working with things in DIP-16, DIP-14, and DIP-8 packages. The long rails on the edges can be used for power and ground. Like the 1" x 1.5" mini prototyping board above - only longer. 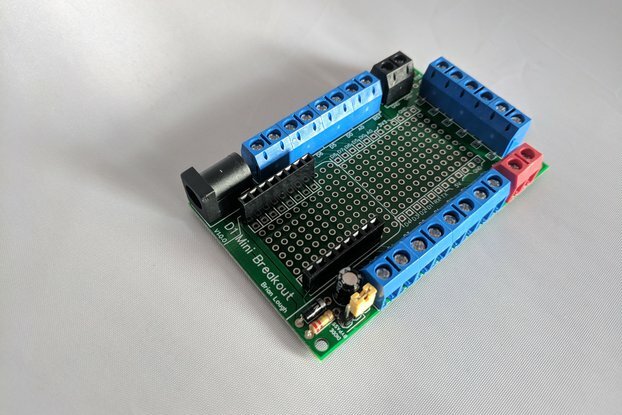 This one is ideal for working with larger DIP packages, up to and including DIP-28, used on the popular ATMega 328p - in fact, this board is the perfect size for building a standalone Arduino! 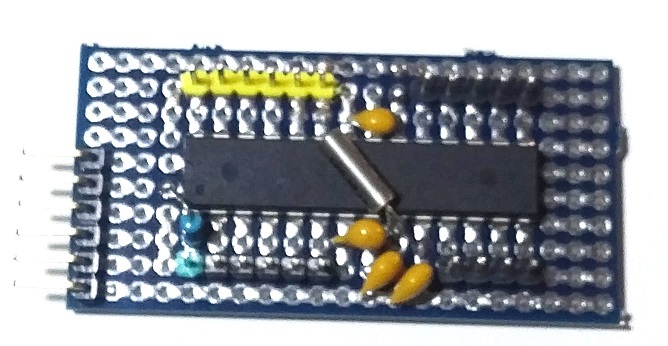 By popular demand, a package of just the ~1" square 3-4-3 mini protoboard. 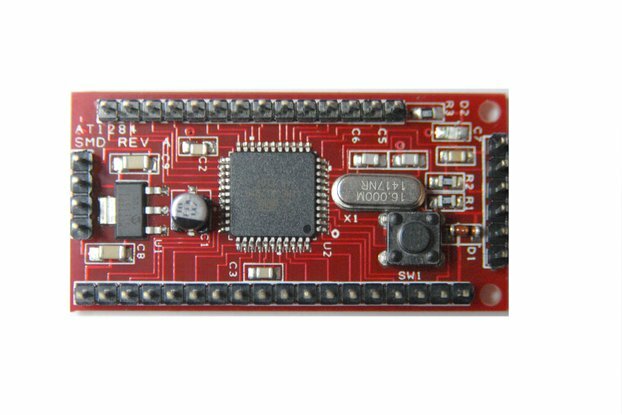 Great for small projects - you can fit a microcontroller in DIP-8, or even DIP-14 and it's supporting components. 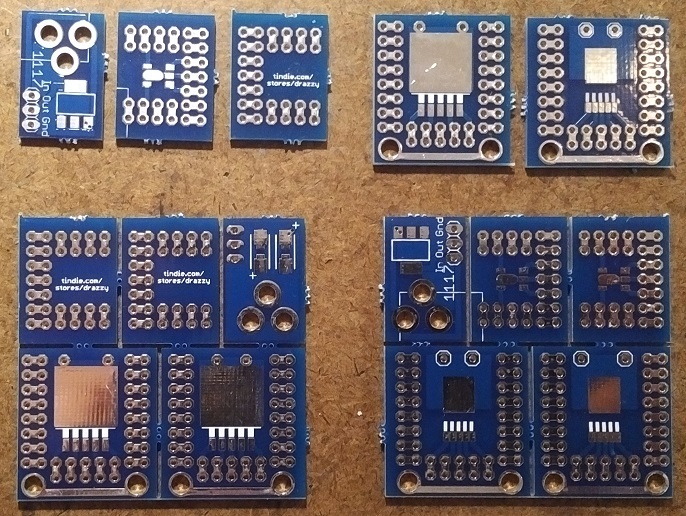 A selection of prototyping boards for some of the most common SMD packages for voltage regulators and similar. 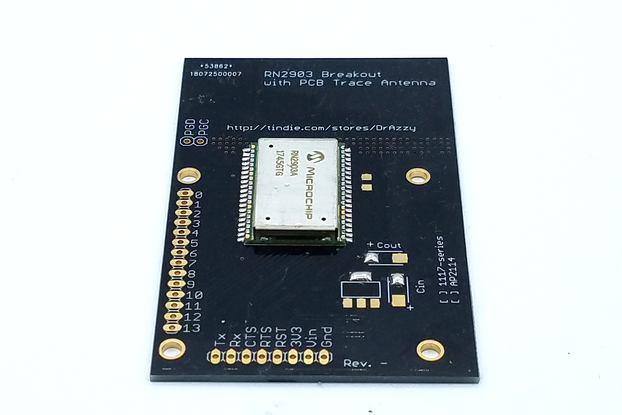 An effort has been made to keep traces short, since many of the interesting parts are switching regulators that require short traces between the chip and supporting components. The TO-252-5 and TO-263-5 packages are typically used for light-medium duty power ICs, like voltage regulators, buck/boost controllers ( like the LM2596 ), and constant current LED drivers. These components typically perform a simple well-defined task, and require a few external components - and often require that trace lengths be kept short. 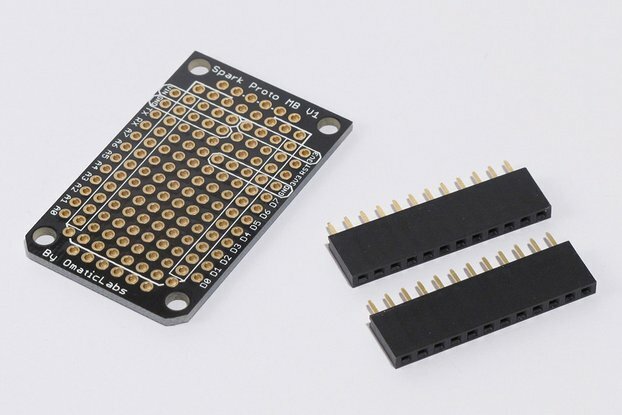 These boards are great for prototyping with parts like that, as they have some prototyping space right on the board so layout sensitive components can be kept close to the chip. 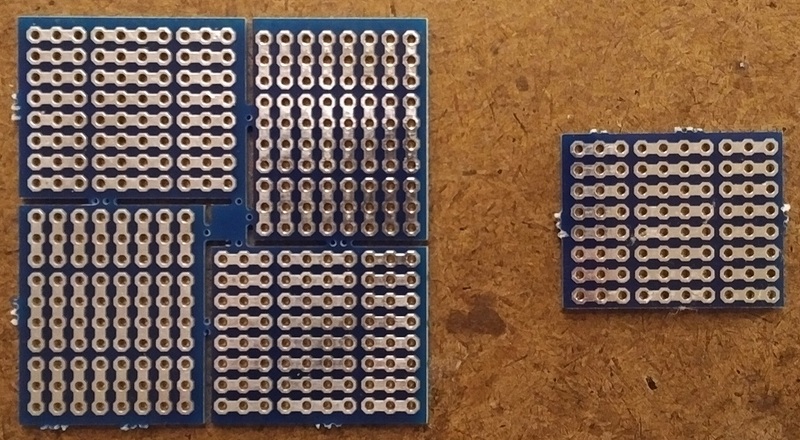 Two rows with 6 groups of 2 pins, connected to 6x 1206 SMD footprints (top) and 4x SOT-23 SMD footprints (bottom). Solder mask color may vary. Currently shipping green. 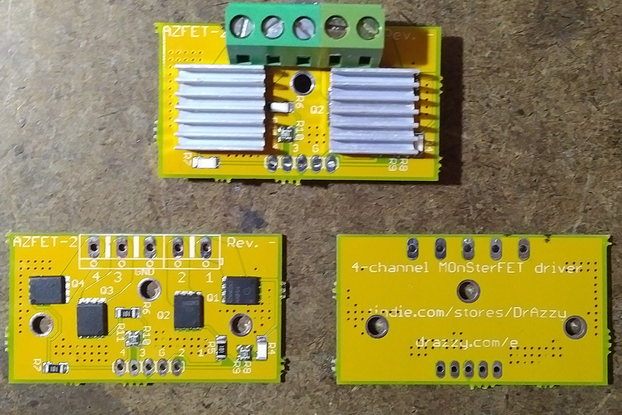 Suggested uses: - Converters between cables or connectors with different pinouts - you can also add some small components if needed - even basic level shifters! 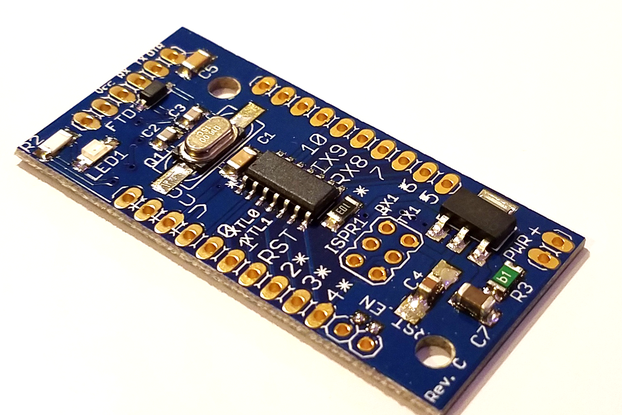 - LED indicator board for test and debugging - Use with SOT-23 MOSFETs - you can put the gate pulldown (or pullup) on the opposite side of the board on the resistor outlines. 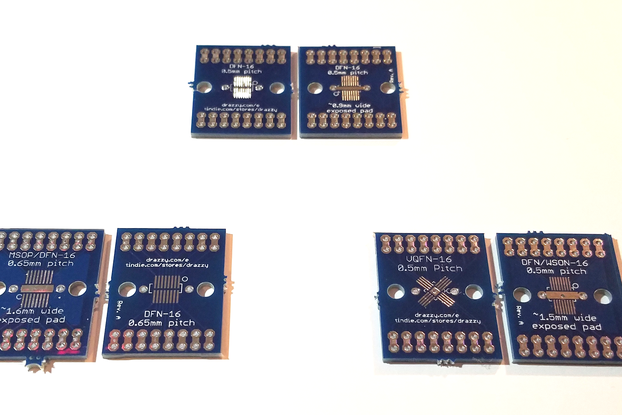 Convert between 0.1", 2.0mm and 0.05" pin header with these 8-pin converter boards. 8 to a package. Solder mask color may vary. Currently shipping yellow. TO-263-5 package broken out to groups of 2 pins, with a row of 8 groups of 2 pins on either side for general prototyping. The TO-263-5 package is typically used for power IC's, like voltage regulators and buck/boost controllers (such as the ever popular LM2596. 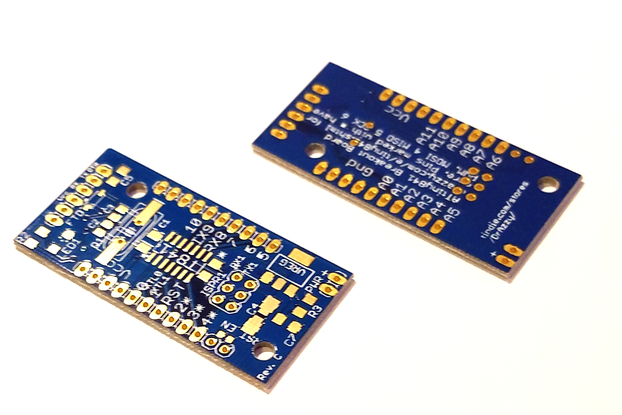 These components typically perform a simple well-defined task, and require a few external components - these boards are just the right size for prototyping with these sort of parts. This is exactly what I was looking for. You can't buy prototyping boards this small, and it's a pain to cut them down. Could have been shipped in a sturdier envelope--it was falling apart--but arrived intact nonetheless. The board quality is better than I expected for the cost. 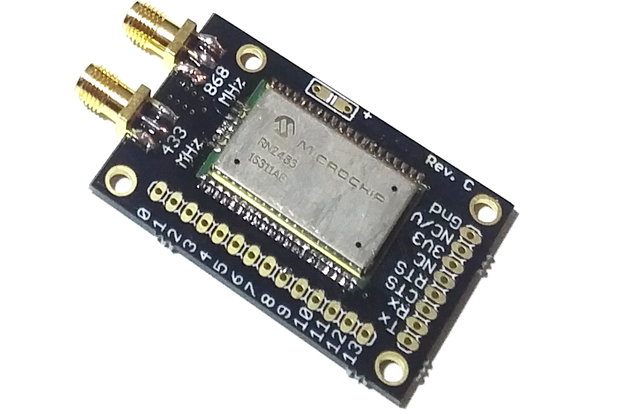 They are far superior to any of the paper (phenolic) proto boards on the market and they provide very good functionality, especially the AVR Tiny proto boards. 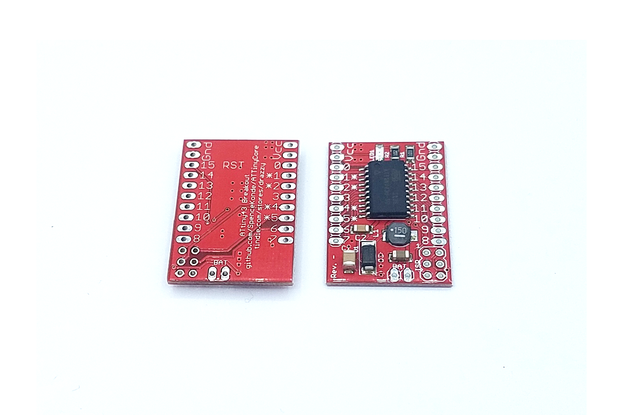 My only wish would be a partial schematic that shows what the interconnects are for boards like the ATiny85 2x2 board or the monster 4x4 board for the AT328 mini Arduino. While I can always trace it out and see what goes where, it would be nice to see it in schematic form. 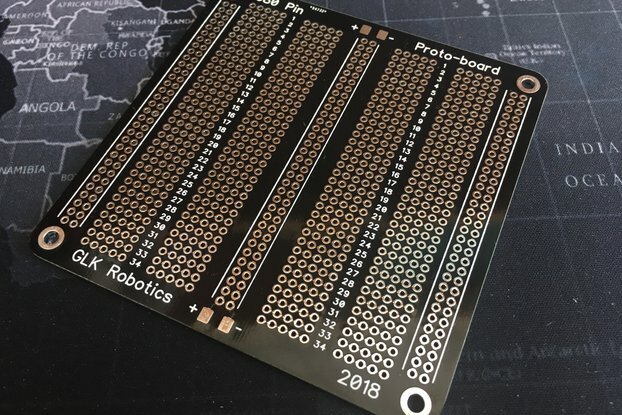 While I understand that it isn't needed for the pure hole only boards, the boards with specific component locations can be time consuming to trace out. The online documentation, while very good, would be excellent with the addition of partial schematics where appropriate. Not sure what else to write beside the summary. Right footprint, everything worked as expected. He's really thought of just about every common situation you might need. Most of them have multiple uses. Great to have on hand! You never know when you might need one. Lovely proto boards, I still don't know what I'm gonna use them for, but they are definitely cute for any project. Great items and quick turnaround! These little strip board pieces will be very handy. I should have bought more.